Federal officials say they will allow North Dakota State University to grow industrial hemp for research provided the school agrees to a variety of conditions, mainly dealing with security. 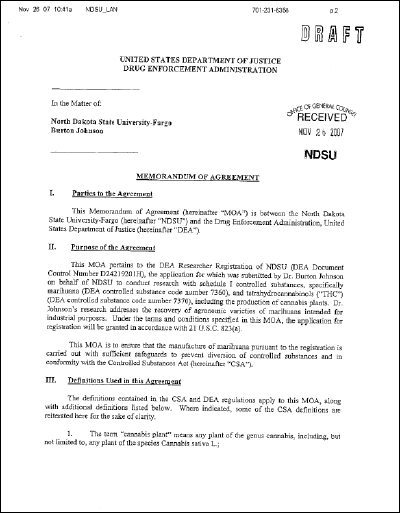 A seven-page "memorandum of agreement" that NDSU officials received Monday came eight years after the university applied for permission from the Drug Enforcement Administration. It also came less than two weeks after a court hearing in a lawsuit filed by two North Dakota farmers who want to grow industrial hemp under state regulations. NDSU's long-delayed federal application was intertwined in that lawsuit. The farmers used NDSU's plight to bolster their argument and NDSU submitted a document supporting the farmers. How's this for a juxtaposition of an ad with a news story? Click on image for a larger version. 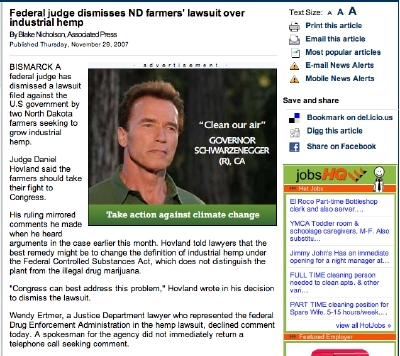 It's an Environmental Defense Action Fund ad at the Grand Forks Herald. Crossposted at Booman Tribune and at DailyKos. I am a senior at Oak Mountain High School in Shelby County, Alabama. On August 16, 2007, I was forced to remove my shirt and to change into one provided to me because the shirt had the word "hemp" on it. The principals claimed that because hemp is associated with marijuana and that school and county rules claim you cannot wear clothing that refers to illegal substances, that I could no longer wear the shirt. I explained to them the difference between hemp and marijuana and explained that because hemp is legal in the United States that the rule did not apply. They refused to acknowledge the facts that I presented to them and forced me to change shirts. I am absolutely disgusted in the suppression of my freedom of speech and the suppression of the hemp movement in my school. I am looking for legal assistance, but if you could even contact my school and let them know that they are WRONG, it would be greatly appreciated! What seems to be lost on the school system in many cases is that almost everything during a student's day can be a teaching moment. Brian Simpson's shirt incident is a perfect example. Thank you for your letter of November 7, 2007. I appreciate all of your research on the matter regarding the definition of hemp as it is used in our society. It is evident that you spent a lot of time and effort in explaining your position on this issue. As a result, I will send the information that you provided to our system dress code committee for consideration for the 2008-2009 school year. Since the use of alcohol, marijuana, and other drugs is prevalant in today's society, your school officials have taken the position to prohibit any items that may remotely promote or symbolize their use. While your explanation shows the different definitions of "hemp," your fellow students and the community at large perceive it to symbolize marijuana. A similar comparison to this would be the controversial wearing of the Confederate Flag. Even though some people view the flag as a symbol of heritage, many people believe it connotes oppression are highly offended by its presence. I appreciate your detailed explanation in your letter. However, I support the decision of your school administrators and will not overturn their decision. No "Hemp" at Oak Mountain? Well, that is what the administrative team at our school ruled a few months ago; a ruling that Superintendent Randy Fuller has recently stated to me that he supports. 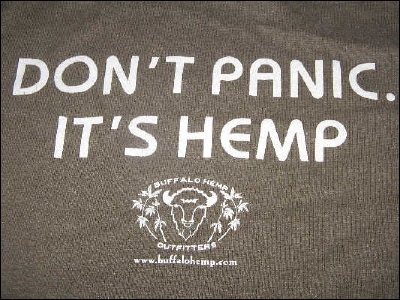 It all started on August 16, 2007 when administrator Brad Hayn stopped me in the hallway concerning my shirt's message, "Widespread Hemp / Don't Panic, It's Hemp." Mr. Hayn expressed to me that "Hemp" was only another name for a drug by the "street name" of marijuana. Although I presented facts that proved otherwise, the administration decided to prohibit the shirt and has enforced the ruling since. After writing a letter and a few meetings, I finally convinced the administrative team that hemp is not marijuana, but instead a distinctively different plant. So wait, why is the shirt still banned? Well, they are afraid that you, the students, might misinterpret the shirt as they once did. They believe this misinterpretation will "generate negative feelings among the student body." Does the word "Hemp" generate negative feelings to you? Were you offended when you read the title of this article? I hope this is not the case; I also hope that you do not hold the common misconception that hemp is marijuana. In case you are confused, allow me to briefly explain. Hemp, commonly referred to in the business world as industrial hemp (to emphasize the non-drug use), is a variant of the species Cannabis sativa L., along with its genetic cousin marijuana. Because they belong to the same species, some confuse them as one plant; although, one would never refer to a Chihuahua and a wolf as the same animal just because they are both belong to the species Canis lupus. Another reason for the confusion is that hemp contains minute traces of Tetrahydrocannabinol, the psychoactive ingredient in marijuana that induces the "high." These traces THC in industrial hemp are in no way large enough to create even the slightest degree of any intoxicating effect. Industrial hemp contains less than .3% THC, whereas marijuana contains anywhere from 5% to 30%. Industrial hemp can be used for fuel, apparel, textiles, building materials, food, paper, and much more. It requires no pesticides or herbicides, its fiber is recyclable, and its oil is biodegradable. It is certainly relevant in today's "environmentally-friendly" marketplace. And in the search for economically-viable renewable resources, industrial hemp is highly important. 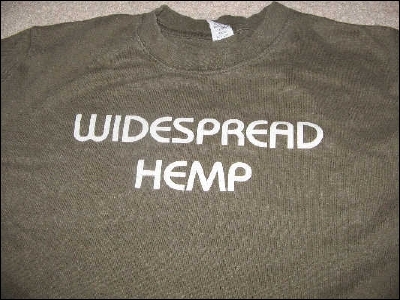 You might be asking, "Why not ask to wear a shirt that specifically refers to industrial hemp to minimize confusion?" I already have and only to receive the same answer. Even a message that specifically refers to the industrial uses of hemp, a message that could in no reasonable way be interpreted as an "illegal substance advertisement" is prohibited at our school. You might also be asking, "Does this mean I must stop wearing my hemp jewelry?" No, you can actually continue to wear your hemp jewelry, purses, clothes, footwear, and socks. You can also continue using your other hemp products such as your lip balm, lotion, and soap; as long as the products do not openly display the word "Hemp" as my shirt did. Strange, huh? I can go to lunch directly after I wash my hands with my Dr. Bronner's hemp soap in 100% hemp apparel and eat my hemp granola bar with my hemp napkin along side, yet I cannot wear a shirt with a message containing the word "Hemp." Being patriotic is not just flying the flag or reciting the Pledge of Allegiance, it is believing in the philosophies incorporated in the Constitution by our Founding Fathers, protecting our rights entitled to us by the Constitution, and in doing so, preserving our freedom that our veterans have fought so preciously for. If you are an industrial hemp supporter or simply a freedom-loving American, please join me in my efforts to protect what is left of students' freedom of speech. These shirts are my tools to advocate and educate on the environmental and economical benefits of industrial hemp. The banning of my shirts violates my First Amendment rights along with my right as a student to non-disruptive, political speech that does not impinge upon the rights of others, affirmed in the Supreme Court case Tinker v. Des Moines Independent Community School District. If you are not offended by the word "Hemp" and words "Industrial Hemp" and are aware of the distinct difference between industrial hemp and marijuana, let your administrator know. Most importantly, call, write, or email the Shelby County Board of Education. With your help, we can simultaneously educate our community on the immense benefits of industrial hemp while fighting to reinstate the same rights that we have learned in school about in the Bill of Rights and major Supreme Court cases. "Make the most of the Indian hemp seed, sow it everywhere." 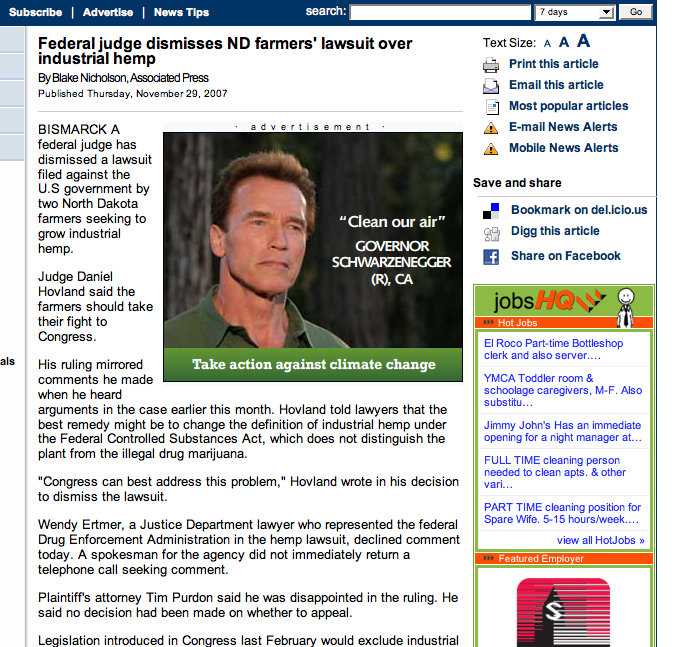 For more information on industrial hemp, please visit www.votehemp.com. I leave you with this question: What message does it send to our children that we are so inflexible in the application of rules in our society? As the stories in this Weekly News Update show, there is a lot at stake in the farmers' lawsuit in North Dakota. We expect an initial decision (on the DEA's motion to dismiss) from Judge Hovland by the end of the month. The court transcripts of last week's oral arguments are quite revealing, and this is a very interesting case on legal, intellectual and practical levels. Last week I attended the Capitol Advantage Customer Day Conference and Capitol Hill reception in Washington, DC. It was very revealing that a large number of people attending the event had seen and read the featured Washington Post story by Peter Slevin. The theme for this year's conference was "The Art and Science of Influence." Even though Vote Hemp is relatively small, we are a national, single-issue, non-profit organization, and much of the training was very applicable to us. A wide range of subjects were covered and included everything from tools and methods for effective communication to overcoming objections to intellectual and emotional reasons for opposing legislation. Former Congressman Max Sandlin of Texas, now with Fleishman-Hillard Government Relations, was one of the speakers in the first session on influencing a legislator's decision-making process. I was able to ask a question on industrial hemp, and Congressman Sandlin both understood the subject and answered the question well. He did so on an intellectual and professional level, and he obviously saw the issue as an agricultural one and kept his personal emotions in check. Dr. Frank Luntz, the keynote speaker, did not do as well with the issue of hemp farming. I was privileged to ask the last question in his lecture, "It's Not What You Say, It's What People Hear." My question addressed what words should be used to overcome objections to industrial hemp farming. He lamented that mine was the last question, and stated that there was no way to overcome the objections at all. It was obvious from the beginning that his answer would come from an emotional perspective rather than a rational one. In the space of a minute, he went from the word "hemp" to hard drugs and recounted the death of a good and talented friend. The emotional overcame the intellectual, and he could not answer my question on a professional level. All too often, that is what we see in the legislative process as well. A single word can evoke very powerful responses, often out of proportion to reality. Compared to the issue of hemp farming on a national level, wearing a t-shirt with the word "hemp" on it to school may seem insignificant, but it can also garner such a strong response. Recently a student at an Alabama high school was banned from wearing t-shirts advocating the use of hemp on them, and he is finding similar emotional responses. In a letter the school Superintendent equated wearing a shirt with the word hemp on it to wearing a Confederate flag! Just because some authorities in our society have tried to hijack the definition of the word hemp and have it refer only to drug varieties of Cannabis does not mean we need to accept it. We know better. Education is the answer, but it will take time. mers overcome the unreasonable roadblocks that have been placed before them. Sometimes it is a little bizarre to think that getting to the point where we can farm industrial hemp in the United States requires little more than overcoming the objections of law enforcement and the drug policy wonks in our government. Our opposition simply does not want to talk about economic development and agricultural policy. "We try to base our positions on science and reality," as I was quoted in the story "Governor Vetoes Second Hemp Bill" in the Capital Press Agriculture Weekly. We have them beaten in those two arenas, so they wield their authority and power to unfairly influence the media and state and federal legislators into believing just about any fictional storyline that they want to tell. Last month, California Assemblyman Chuck DeVore (R-Irvine) was quoted as saying "there are going to be some practical lessons learned from North Dakota that show this is not the boogeyman to law enforcement that some people try to make it out to be." The issue of hemp farming has never been a problem for law enforcement in North Dakota. Every piece of legislation that has been put forth in the past decade has passed overwhelmingly. In an interesting turn of events, just before oral arguments next week in Bismarck, North Dakota State University (NDSU), a publicly-funded land grant university, has taken the unprecedented step of submitting an amicus brief in support of the two North Dakota farmers trying to grow hemp there. The legal case is funded entirely by Vote Hemp, thanks to contributions from supporters like you. Please make a contribution to Vote Hemp today. Your donation to our Hemp Farmer Licensing and Legal Support Fund will help North Dakota (and soon, we hope, other) farmers overcome the unreasonable roadblocks that have been placed before them.